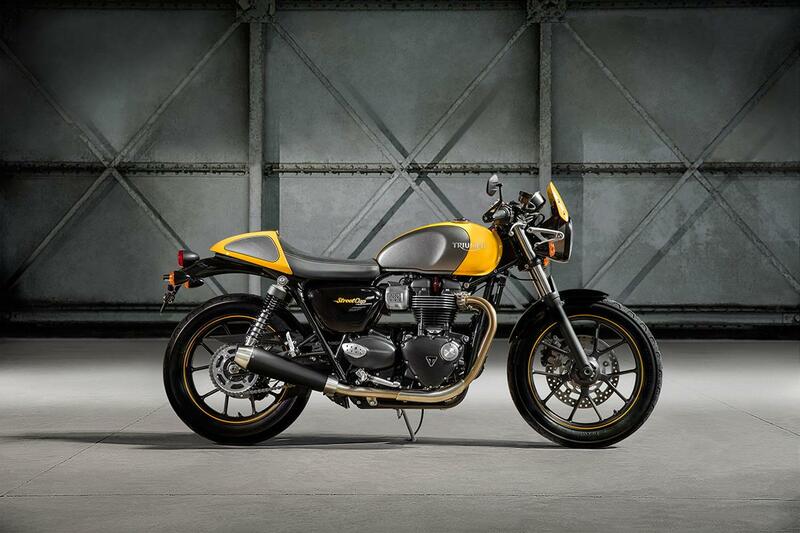 If you’ve been lusting after the gorgeous T120 Thruxton this year, but didn’t feel comfortable with the size, power or price, salvation is here – and it’s called the Street Cup. Essentially a Street Twin, the Cup gets a handful of mods to transform it from modern classic roadster, to cheeky café racer. It really works in the metal, bridging the gap between the substantial T120 and something dramatically smaller – like Guzzi’s V7 Racer, or Royal Enfield’s Continental. The most distinctive new elements are the bullet seat and removable seat cowl, fly screen, drop bars and bar end mirrors, while the two-tone paint options also hark back to the golden era of café racers – especially in black and silver. The power beneath the throne is the same 900cc High Torque Bonneville engine found throughout the range, but the Cup gets its own shorter and lighter twin satin black and stainless steel upswept silencers, and the same ride-by-wire, switchable traction control, ABS and a torque assist clutch as its siblings. Compared to the Street Twin the rider is seated slightly higher and further back, while the handlebar position is lower and slightly further forwards, putting the rider in a sportier position on the bike. The new model-specific rear suspension units are longer (though still with the same 120mm rear wheel travel of the Street Twin), which raises the back end and steepens the head angle to enhance the bikes agility. There’s also a new 2-piston sliding axial Nissin caliper with machined branding and a floating brake disc acting as anchor. There are over 120 accessories in the catalogue to allow owners to really make their bike stand out from the crowd, and just like the other T100s, there will be an A2 licence restrictor kit available from Spring 2017 – making it one of the coolest A2 options on the market. It will be available in Racing Yellow and Silver Ice with Jet Black, or Jet Black and Silver Ice with Gold – both boasting hand-applied coach lining.